According to NHTSA, the frontal barrier test is a simulation of a head-on collision between two similar vehicles, each travelling at speeds of 35 mph. Using a crash dummy, NHTSA measures the force of impact to the head, neck, chest, pelvis, legs and feet of both the driver and the front passenger. All tested versions of the Tesla Model X aced the frontal barrier test and scored five stars for each sub-category (front driver side and front passenger side). On the other hand, the side crash tests are simulations of intersection collisions where a vehicle hits another vehicle on the driver’s side. This test entails having a 3,015-pound moving barrier crashing into stationary vehicle at speeds of 38.5 mph. NHTSA then measures the force of impact to the head, chest, abdomen and pelvis. Meanwhile, side crash tests are also simulations of crashes into fixed objects like utility pole or a tree. Here, the vehicle – angled at 75 degrees – is pulled sideways at speeds of 20 mph into a pole at the driver’s side. NHTSA then evaluates force of impact to the head, chest, lower spine, abdomen and pelvis. Tesla’s 2017 Model X (all variants) was able to earn an overall side crash rating of five stars, after achieving the same scores in every sub-category -- side crash driver side, side crash passenger side, front seat rating, combined rear seat rating, side barrier rating and overall side pole star rating. Meanwhile, the rollover resistance test simulates a scenario in which the driver losses control of the vehicle, like when moving too fast while negotiating a corner. The test measures the risk of rollover in such a scenario. The rating is derived from the so-called Static Stability Factor (SSF) and a driving maneuver that evaluates whether a vehicle would tip up on the road. As tested by NHTSA, the Tesla Model X earned five stars. This is thanks to the fact that the battery pack of the Model X is mounted beneath the floor, resulting to very lower center of gravity and a very low risk of rollover. 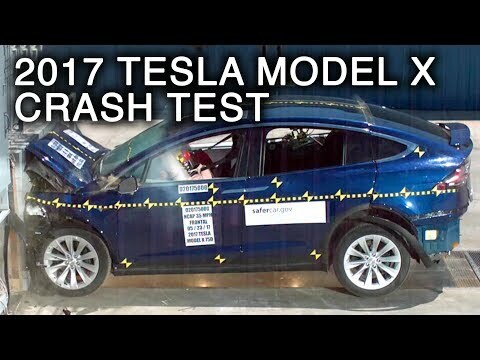 As per Tesla, the results of the tests by NHTSA show that in case of a serious crash, occupants of the Model X have a 93-percent chance of walking away from the crash without incurring a serious injury.